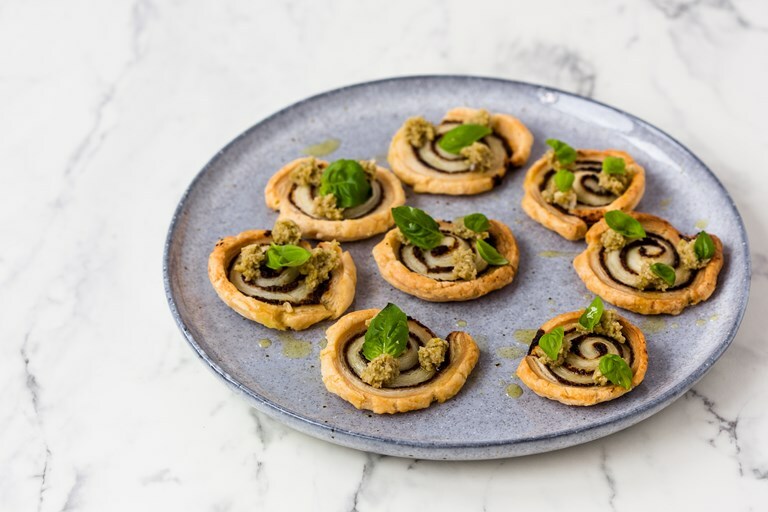 This stunning mushroom palmier recipe makes a great vegan canapé for Christmas, topped with lightly truffled green olive tapanade for wonderfully more-ish flavour. Certain brands of puff pastry are a vegan's best friend for the festive season – just make sure you check the label first. I know these aren't technically the correct shape to be considered a palmier, but I think these are more visually pleasing! These simple canapés can be done well in advance and just so happen to be vegan. For frequent dinner party-throwers, you can keep a roll in the freezer to pull out and bake with only twenty minutes notice.